COLUMBUS — A freshman running back leading the Big Ten in rushing is unusual. Having the top two backs in the league be one year removed from high school is unexpected. And having those two backs play for the two best teams in the Big Ten, not for talent-poor teams, goes right up to the borderline of unbelievable. But when Ohio State plays Wisconsin in the Big Ten championship game on Saturday night, the two best running backs on the field will be freshmen. Wisconsin’s Jonathan Taylor leads the Big Ten with 1,806 yards and Ohio State’s J.K. Dobbins is second with 1,190 yards. Taylor, who was rated a 3-star prospect and did not enroll early, is only the sixth freshman to lead the Big Ten in rushing since freshmen became eligible in the early 1970s. The last player to do it before him was Wisconsin’s P.J. Hill in 2006. Dobbins was rated a 4-star prospect and enrolled at OSU in time to participate in spring practice. Wisconsin and great running backs have gone together since Barry Alvarez became the Badgers’ coach in 1992. Four of the top 10 all-time leading rushers in the Big Ten are Wisconsin players of the last 25 years. Both made a big impression not long after they arrived on campus. “He’s played like he’s been here for a few years,” Ohio State linebacker Jerome Baker said about Dobbins the week of Ohio State’s opener, an opinion immediately validated when Dobbins ran for 181 yards against Indiana in his first college game. Taylor also introduced his teammates to what he could do before the season. “He shows up ready to work and he’s a grown man. It’s very rare to have a guy that young come in and provide that for you,” Meyer said. “There are certain things he can improve on and just his physical strength. Meyer looked back at more than two decades as a head coach to show how unusual it is for a freshman do what Dobbins has done. “Zeke (Ezekiel Elliott) played a little bit here as a freshman but certainly wasn’t a 1,000-yard rusher. At Florida and Utah I don’t believe we ever had a freshman come in and play like this. Mike Weber didn’t do that, he ran for 1,000 his redshirt freshman year,” he said. Don Speck | Aim Media Ohio State freshman running back J.K. Dobbins makes a cut on a carry against Nebraska earlier this season. 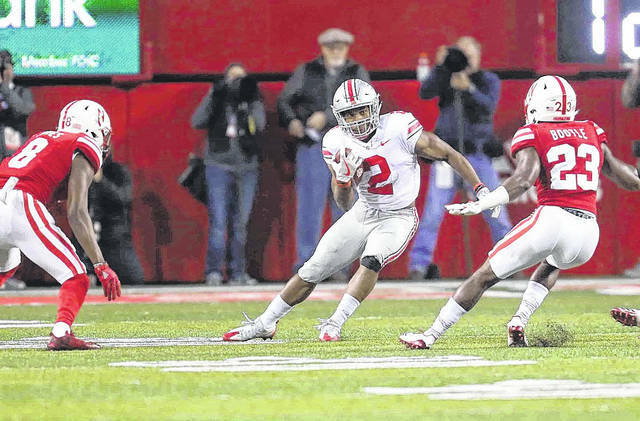 https://www.galioninquirer.com/wp-content/uploads/sites/38/2017/11/web1_NewJK.jpgDon Speck | Aim Media Ohio State freshman running back J.K. Dobbins makes a cut on a carry against Nebraska earlier this season.